Grandma Knows Best | Cohen Bros.
A few years ago two of my mother’s best friends came in to see me, Millie and Annette. I have known them for pretty much my entire life and it was great to see them. However, this was more than just a social visit. That was very good advice. Millie ended up buying each of the girls exactly the same diamond bracelet and the girls loved them. I have told that story many times over the years and anyone who has a daughter or a granddaughter can relate. Just a few weeks ago, a very lovely customer of mine called from Florida and said that she’d like to buy her twin granddaughters each a beautiful piece of jewelry for their high school graduations. She was thinking of buying one a pair of diamond studs and the other a diamond pendant. I then told her the story of Millie and Annette and she agreed immediately. 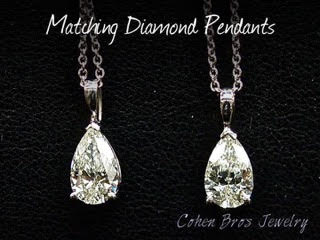 She ended up buying each of them a teardrop diamond pendant…and I’m told they were a huge hit!